You gotta hand it to the progressive bureaucrats in Seattle. They have figured out a way to continually get elected by NPC citizens who approve of politicians stealing and abusing their taxpayer dollars. “The West Seattle Health Club blames homeless people and a group of RV residents who live nearby. But now, the city is telling the club — clean up the trash, or pay up. The health club says it can’t believe the city is putting that responsibility at their doorstep. Most of the trash is in the bushes and brambles behind the health club. “You can see all the garbage that’s all in there,” said Jason Davis, the club’s facilities manager. “There’s a whole barbecue, TV stand, a nightstand down there, clothes, a bike,” Davis pointed out. There’s also plastic bottles, entire bags of trash, shoes – you name it. “All of this comes from the homeless and all the RVs we have around here,” Davis said. “It’s very frustrating. Especially when I walk around my building and have to clean up human feces and everything else,” he said. Davis said he and his staff also find needles every day. On Wednesday, a city inspector came by the property after someone complained the blackberry bushes were encroaching on the sidewalk. KIRO7 found the complaint online. The complaint doesn’t mention the trash. But the inspector, with the Seattle Department of Construction and Inspection, who came by to examine the bushes, noticed the garbage, and said the club needs to clean it up. If the club doesn’t, it will likely face a fine. “It makes me very angry,” Davis said. The club says it’s been dealing with the trash problem all year. After the nearby residents kept filling up the club’s dumpster, Davis said waste management brought a bigger dumpster. The club’s vice president of operations, Dan Lehr, said its trash bill has increased by $500 per month. The club has installed a 7-foot fence to prevent access to the dumpsters. Now it says the RV residents started have throwing trash around the fence and into the bushes behind the club. Now the club is facing another big expense – cleaning up that trash. “It’s not our fault. You (the city) are allowing the RVs to be there,” Lehr said over the phone. Plus the club is still dealing with the aftermath of a van that crashed into its building two weeks ago, setting one wall of the club on fire. 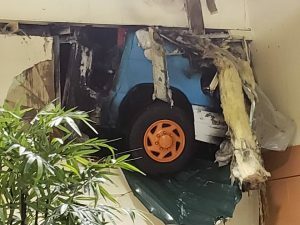 The club says it was a van-turned-RV and had been parked nearby for months before it crashed through the wall and put the club’s pool room out of commission. The damages from that are topping $300,000 and the club is still working on repairs. The pool will be closed for several more weeks. “We’re dealing with increasing costs every day,” Lehr said. The Department of Construction and Inspection said the club is responsible for the trash dumped on its property because municipal code requires owners to maintain their property. It gave the example, if someone dumps a couch on your front lawn, though unfortunate, you are still responsible for getting rid of it. This entry was posted in crime, Health Care, Insanity, Liberals/Democrats/Left, Taxes, United States and tagged homeless industrial complex, Mayor Jenny Durkan, Seattle, Seattle City Council, Seattle Department of Construction and Inspection, Seattle's homeless crisis, Washington State, West Seattle Health Club. Bookmark the permalink. Comrades, please refrain from defecating or throwing debris on the huge Lenin statue in the Fremont area of the glorious people’s republik of Seattle. Enjoy the legal weed but please do share because what is yours also belongs to the collective. Forward! I was gonna suggest that the club owner collect the garbage & deposit it at the Seattle Department of Construction and Inspection, but I like Lophatt’s suggestion better.